204 pages | 5 B/W Illus. A great deal of political and academic responses to the Israel/Palestine conflict have construed the Palestinians as an object of Western and Israeli discourses, rather than their own Palestinian discourse. This has hindered understanding of the internal mechanisms involved in the production of the Palestinian conditions. Palestinian Political Discourse presents an in-depth examination of Palestinian political discourse since an-Nakba in 1948 and stitches together the underlying mechanisms and rules that have shaped Palestinian politics, in turn synthesizing, interpreting and scrutinizing these rules. Studying the question of Palestine discursively offers new ways to rethink political agency, structures, identity, institutions and power relations while interpreting Palestinian actions. This book adds new understanding to Palestinian political agency by explaining how political actions were constructed. Discourse analysis methodology underlies the critical examination of the genealogy of concepts and frames that have oriented Palestinian political thought. 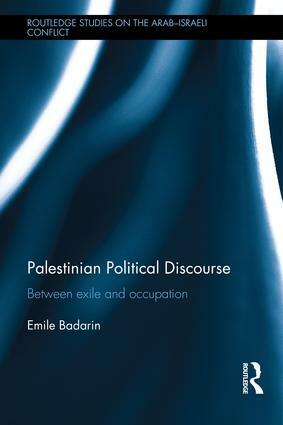 Contrary to established views that ascribe shifts in Palestinian politics primarily to external factors and international changes, this book demonstrates how transformation has been a continuing inbuilt feature within the discursive regime and that dramatic shifts were only effects of much deeper, slowly evolving changes. Examining discourse, and thus language, offers an exceptional possibility to see from the Palestinian perspective. As such, this book provides material vital to the deeper interpretation of the Palestinian question. It will be a valuable resource for students and scholars of Israel-Palestine studies, Middle East studies, and discourse analysis. Introduction Chapter 1: Since That Day and Beyond Chapter 2: A Solution: Remaking the Joints Chapter 3: A Referential Function Interlude 4: Peace from within the ‘Process’: A Metaphorical Conceptual System Chapter 5: A Discontinued Image of Palestine Chapter 6: Peace, Security, "Us" and "Them" Chapter 7: What Makes the Palestinian Discourse? Emile Badarin is a researcher in Middle East politics. His research interests cut across the disciplinary boundaries of International Relations Theory, Middle East politics, Israel-Palestine, discourse analysis, settler-colonialism and peacebuilding.